Abigail Reynolds is the current artist-in-residence at the Rambert Dance Company and to celebrate the company’s move to their new home on Upper Ground, she conceived Double Fold as a choreographic work in response to an installation of suspended acoustic panels that were cut out from the walls of the company’s old rehearsal space in Chiswick. In their recycled form they hang in the centre of the magnificent new Rambert Studio like an exploded axonometric view of soft interlocking planes. What attracted Reynolds to these panels was their symbolism: they contain — if only we could decode their stored experience — the voices, breath, sweat (and smoke) of thirty years of rehearsals: a material history of the company that provides a somatic link between old and new. Chairs for the audience arranged around the installation define the performing area. The panels and Malcolm Glanville’s clean lighting create a sense of architectural design reminiscent of the intersecting planes in Gerrit Reitveld’s work, which was in turn influenced by the ideas of Piet Mondrian and the de Stijl movement. The positive and negative spaces create a small theatre within this expansive studio, focusing our attention from architecture to dance. Hannah Rudd is the first of the five dancers to ‘enter’ the installation, bowing deferentially in front of a horizontal plane before crawling under it and following a maze-like path through the panels, mirroring the material shapes with her own. The fabric panels are hung to the scale of the dancers’ anatomy and the other four (Kym Alexander, Carolyn Bolton, Patricia Okenwa and Simone Damberg Würtz), loosely costumed in earthy colours by Rosalind Keep, likewise respond to the shapes with their bodies: placing their arms either side of a panel, kneeling or back-bending to fit neatly into an open space, the delicate planes broken or enhanced by sculptural movement. 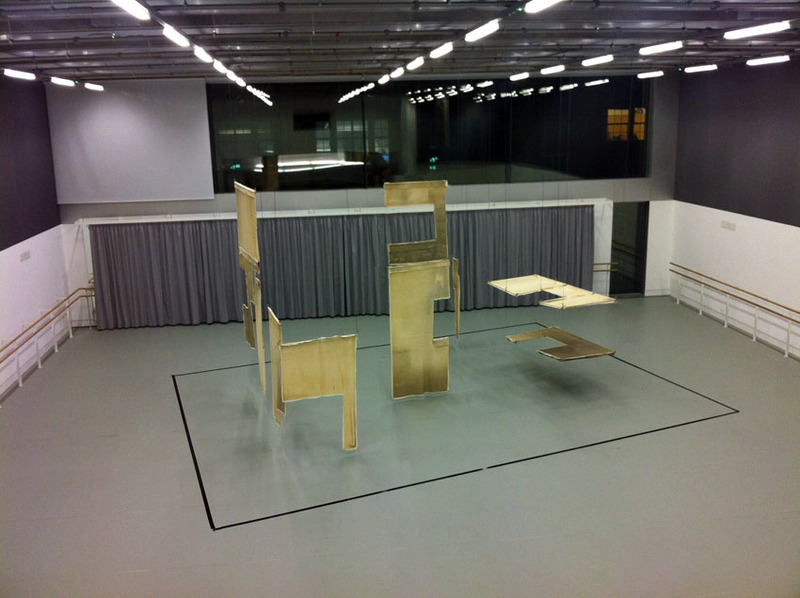 How you see the dancers in relation to the panels is a question of perspective, so after the fifteen-minute work is performed once, the audience is asked to move seats to see it again from another angle. It is an idea drawn from the art gallery, where the public has the freedom to wander around an object instead of contemplating it from a fixed point. It also derives from the cubist construct of seeing a single subject simultaneously from different angles. The gesture is reciprocal: while Reynolds is feeding the dancers with the richness of her visual training, the dancers define the visual elements with the quality of their dynamics. 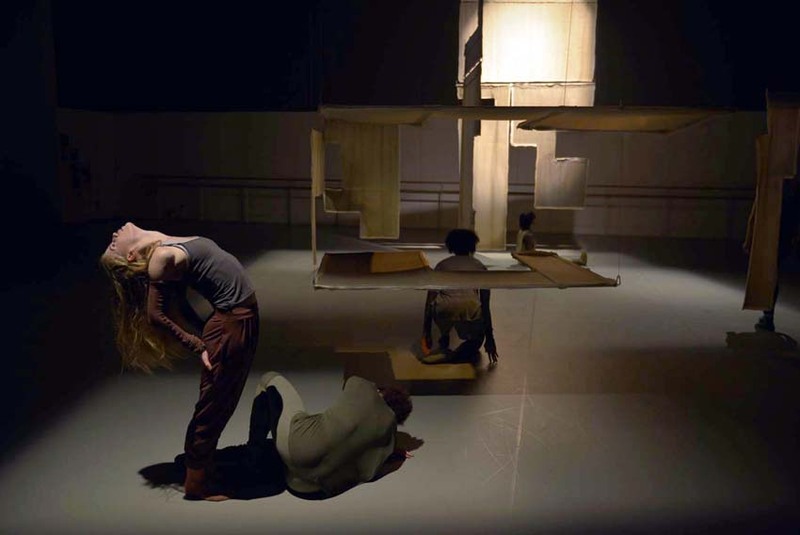 The movement for Double Fold was conceived by Reynolds in close collaboration with Kirill Burlov, a Rambert company dancer and choreographer, whose role was to bridge whatever gap existed between visual and movement vocabulary. The unity of the dance and its environment is evidence of the clarity of Reynolds’ vision and of the subtlety of Burlov’s contribution: the panels interlock in the same way the dancers interlock; body images are formed in and through the cutout spaces, like photographs; a torso here, a foot there, endlessly rich in visual imagery. The five dancers move through the spaces as if through a piazza on a sunny day, alone, in duets or trios, framing and being framed by the light and shade, never separated from their architectural environment. Boundaries were challenged in the creative process: Reynolds had not initially conceived the panels as being part of the dance, but Burlov instinctively suggested the dancers wind themselves up in them like coats or scarves (Rudd, under the watchful eye of Okenwa, for a moment seems to revisit the fate of Isadora Duncan). ‘Double fold’ is a librarian’s term for testing the brittleness of paper by folding it one way and folding it back again. Seeing the dance from a different angle, we are in a sense folding the dance back on itself, but its resilience is enhanced. Dancers that had been in shadow are now in the light and choreographic processes are revealed afresh, countering the ephemeral nature of dance. No live performance is the same as another, and even here, back to back, Double Fold reveals new qualities and images, and the score by Emika, which begins in dense electro-acoustic sound and softens to a solo piano, filters more clearly into our consciousness as yet another overlapping, interlocking element. After the performance there is a panel discussion hosted by Rambert’s artistic director, Mark Baldwin, on art and dance with Reynolds, Michael Craig-Martin and Catherine Yass. The discussion both derives from what we have seen and suggests a basis for continued exploration, something Rambert does so well. On the way out, in the light-filled lobby, are two portraits of Madame Rambert, one more formal, the other quite free in the style of Isadora Duncan. Reynolds created the distinctive frames, and seems to have framed her dance within these very parameters of Madame Rambert’s image.